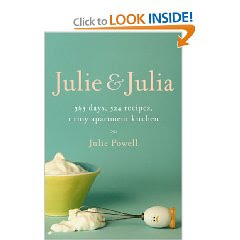 Julie and Julia: 365 Days, 524 Recipes, 1 Tiny Apartment Kitchen by Julie Powell. Little Brown, 2005. Paperback edition renamed Julie and Julia: My Year of Cooking Dangerously. Reviewed 2005 hardcover; personal copy. The Plot: One of the first "book based on blog," this recounts Julie Powell's year long obsession with making every recipe in Julia Child's Mastering The Art of French Cooking, Volume One . The Good: Believe it or not, I bought this back in 2005, when it first came out, but only got around to reading it now because of the movie version of the book, Julie & Julia. I cannot wait till that film is on DVD. I really enjoyed Powell's memoir; what led her to start cooking Julia Child's book, and to blog about it. Thankfully, Powell never calls what she was going through as any type of "life crisis" (seriously, one of my pet peeves is the whole quarter life crisis etc.) What she is going through is something that is not so uncommon: feeling adrift in your own life. We live in such a driven culture, where the young achiever and go-getter is the one who is given prestige and honor, that we need reminders: not everyone knows what they want to be, and goes for it, at age 14. Or 18. Or 21. Or 25. Or, for that matter, at 35, 40, 45. Or, people may know what they want -- and life happens and they, wait for it, change their mind. But because, again, we're in a culture that demands you know, at every moment, your endgame, the idea that someone doesn't know is viewed as wrong. The idea that what one wants may change is viewed as negative. I still get odd looks because I changed careers, as if there is something wrong, with me, for changing my mind. And I'm sure, should I change careers again, I'd get the same looks. The only acceptable path, it seems, is the one where you know from age 14 what you want and go for it and anything else is less. But it's not just twentysomething Powell that this is about -- it's not just Powell reinventing herself as a writer. It's also about Child, who reinvented herself as cook and writer in her 30s and 40s. So here we have Julie Powell: in a dead end job that pays the bills, lacking anything to be really passionate about, and deciding to put that passion into a slightly odd cooking project. I love her honesty about this, about her searching. I love how in her own memoir, she isn't afraid to show her own flaws -- and despite this, no, because of it, she remains likable. But I have to make a disclosure: she likes Buffy! You know I'm going to love anyone who loves Buffy. While there are things in the book about cooking, and the cooking project, this is so much more. Powell created a narrative around that project; those interested in the actual Julie/Julia cooking experiment can check out the Julie/Julia blog, which is still around. So, a handful of recipes are mentioned and described, but not each. and. every. one. Instead, it's her life, her friends, and what she learns along the way. What's also interesting is the real person versus the imagined; Powell at times imagines a scenario from Child's life. At the end of the book, she finds out that Child knows about her project and is less than impressed. Ultimately, Powell realizes that the "book" Julia Child is who matters to Powell, not the person. But isn't that true of many of us, who think we "know" someone? Here among book bloggers, how many people think they know an author or blogger based on there words? But, really, don't. And does it really matter? I read Meg Cabot's blog (and love when she comments here or otherwise throws out a shout out to this blog), and am secretly convinced that if we met we'd be best buds and spend our time watching TV and movies and eating. But, really, I don't know her. Not really. Finally, as a blogger, I love the blog stuff! The happiness over comments, the oddness of people you don't know knowing you, the realization that real people read your blog. Powell's next book is out this December, and is called Cleaving: A Story of Marriage, Meat, and Obsession . Do I care about butchery or butchering? Nope; but I love Powell's voice, so cannot wait for it to be published. Am I inspired to start French cooking? Are you crazy? It's like 80 degrees in the shade! My kitchen doesn't have air conditioning! Plus I'm trying to lose weight! I don't have the time, hello, I blog, don't make involved French recipes. But if you are so inspired, invite me over. Hilarious and spot on review! I felt the exact same way. I just finished it last week and posted a small snipit in my blog. I thought if I had met Julie Powell that we would hit it off and be best friends. I mean, come one, she loves Buffy and I believed I was the number one fan! THanks for the info on her new book. I did not know! Thanks so much for this review! I didn't read the book until shortly before the movie came out, and now I'm completely in love with both. And I'm also really looking forward to Cleaving! I was thinking about this a lot last month, with re-reading the book and watching the movie. There's always something said somewhere about how food bloggers supposedly don't like Julie Powell. The thing is, I never really thought of her as a food blogger. Not in the way I think of other people as food bloggers. I think of Powell more as a personal blogger who was using food as a tool to tell her story but for food bloggers, even those who tell very personal stories, food is so central to their narrative their story can't work without it. I have no idea if the distinction makes sense to anyone but me. I liked the book but saw the movie yesterday and I LOVED the movie--worth the price of a ticket and then some. MY favorite parts of J/J were the the snippits of JC so I am now just finishing "My Life in France" by Julie Child (the movie is actually based on THIS book, not Powell's). I LOVE this book. Of course it covers much more than a year and we are certainly more familiar with Child than Powell, but it is a wonderful book. Hope you find time to read it too AND see the movie! I can kind of understand how the food bloggers feel; I know my back gets up whenever someone "discovers" YA and starts blogging about it like no one has ever read or blogged YA before them. You know to be honest I saw the preview for that movie, and I wanted to buy the book too. It sounds wonderful, I hope to get it soon.